Sunday afternoon honky-tonkin at an American Legion in southern Illinois. Inadvertently completing a live music filled weekend, I stopped in a honky tonk in southern Illinois, adding outlaw country style music to the alt-alienation rock and positive energy singer/songwriter genres I’d enjoyed the day before. I’ve been going to southern Illinois honky tonks since I was 16. The drinking age was 19 back then, but as long as you looked at least 15 they generally wouldn’t card you, or were so lax about fake ID’s that you could pretty much scrawl one out with a crayon. The downside was that there was almost always some local tough looking to start a fight. There is a long history of young people from southern Indiana fighting their way through bars across southern Illinois. Mostly it was just what passed for good fun in that culture, but some places were worse than others. Old Shawneetown,for example, was notorious, and people actually died there. But generally, if you didn’t want to fight, which I sure as hell never did, you just had to be able to put up with a bit of provocation. Those with fragile egos usually couldn’t take it, and we wouldn’t bring them along again after the first time they got beat up. But if you could play it light, the bully would eventually give up and maybe even buy you a beer. Wanting to beat someone up wasn’t personal, it was just a way of life over there. Anyhoo, maybe it’s not like that anymore. I still drop in from time to time, but I’m never there late, so I wouldn’t know. These days, I like the live music and the crowds. 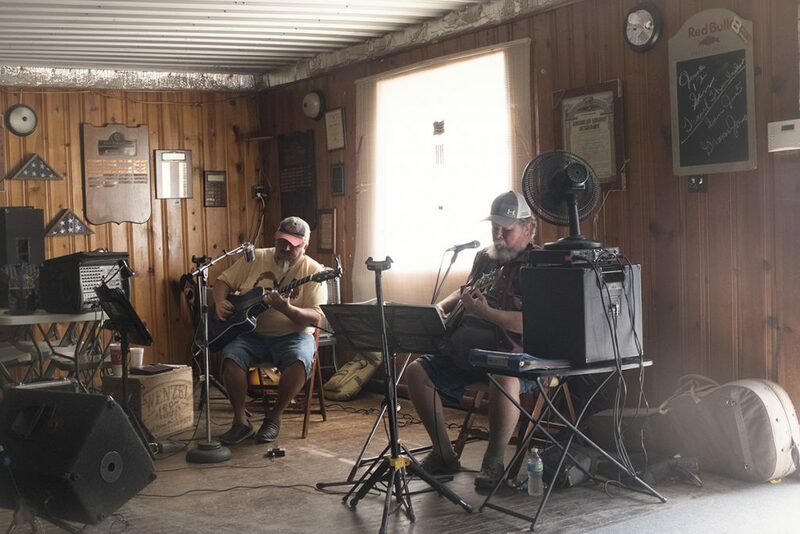 The performers are typically guys in their 50’s who have been playing in classic rock/outlaw country bands since their teens and have gotten very good at it. The crowds are mostly older people who still party like they did when they were teens, but a lot of times there are actual young people and the dance floor gets full. Depends on the band. The one pictured above didn’t bring in the young crowd, but they were very good. Their performance of “Angel from Montgomery” that almost brought tears to my eyes. On a sad note, the picture above may demonstrate another example of job killing technology ravaging the working classes in rural America. If you look closely, you can spot a drum machine and sequencer, meaning some poor drummer is out of work. Or maybe not. It’s possible that most of the midwest’s outlaw rock drummers who would be fifty-something now have long since died of drug overdoses or alcohol poisoning, or just can’t get out much anymore since they’ve cut down on prescribing opioid pain killers. Seems the drummers always lived the hardest.